President Trump made a pretty direct threat to online communities today. 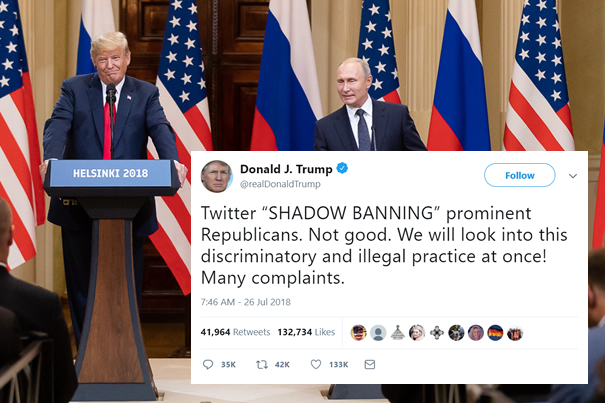 Shadow banning (or global ignore), which is not an “illegal practice,” is when you allow someone to continue to use your community or platform, but dramatically reduce or completely eliminate their visibility to others. They post, but they receive limited or no response because no one is seeing their content. The hope is that they leave. Most community and platform operators reserve this tool for particularly destructive users, and those who will not respect ordinary bans. Some, in my view, abuse it. And, within the industry, you’ll find disagreement on the ethics of deploying such a tool. But regardless, it goes to the core of community management, and the ability to block people and content in the manner that you deem appropriate for the community that you are responsible for. One of the greatest dangers to our work is clueless people who are not only grandstanding, but have the power to affect policy in a shortsighted way. This is true whether or not Twitter is actually “shadow banning,” whether or not Trump has his facts straight and whether or not Twitter is doing a good job. The bottom line is that Section 230 of the Communications Decency Act is under attack. This is deeply troubling for online community builders. Section 230 is the legal basis for our work in the U.S., enabling us to moderate while ensuring that the liability for what is said remains with the author of the words. Without Section 230, when you remove a bad post from your forum, you become liable for the posts you chose not to remove, as if you made them yourself. The act of good community management opens you to liability, which will be taken advantage of to silence voices on communities of all sizes. Section 230 and the SPEECH Act team up as a formidable duo to protect the work that we do in this country. One of the reasons I have been consistently critical of Facebook, Reddit, Twitter and others is because of my fear that their decisions would lead to legislation that wouldn’t just target them, but would harm all of us – communities big and small. We’re getting closer to that. Senator Ron Wyden, one of the co-authors of Section 230, is sounding the alarm. “We envisioned that the law would be both a sword and a shield,” Wyden told The Verge. “A shield so that you could have this opportunity, for particularly small and enterprising operations to secure capital, and then a sword [by allowing them to moderate without facing liability over the practice], which said you’ve got to police your platforms. Facebook, Reddit, Twitter and others may end up as a catalyst to undercut the law that empowered us in the first place, that empowered me as a kid, 20 years ago, to start moderating communities. I hope Wyden, Senator Edward Markey and others will continue to fight for these principles. Community pros should be right behind them. If the President Used Your Community to Self-Promote, What Would You Do? Hey the post is very informative, keep posting & updating. Thanks a lot very much for the high quality and results-oriented help. I won’t think twice to endorse your blog post to anybody who wants and needs support about this.